Sean brought his extensive experience in marketing and branding with Nestle to the wonderful world of Animal Rescue. 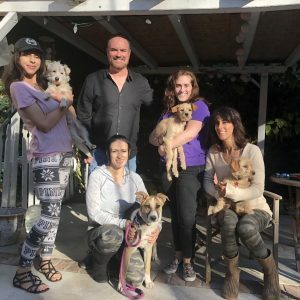 As a former high tech executive and longtime animal welfare volunteer and pet parent, Sean Downey knew there had to be a better way to help save animals. Americans spend over $66 billion dollars a year on their pets, yet 2.7 million enter shelters every year and over 1.4 million animals are euthanized. Rescue organizations had become one of the primary outlets for adopting and fostering animals, but they consistently lacked the necessary tools, resources and funding. Applying his background in business, Sean first developed cloud based software, My Buddy’s Place, that helped rescues manage their animals, volunteers, and fosters. Information is then transferred to pet parents through an easy to use mobile app upon adoption. “Better information is one of the keys to better adoptions”, Sean believes. Although his solution helped rescues save time, they still needed more funding. Investment banks and venture capital money was flooding into the pet care business. He wanted to see the animals benefit more than the bankers, and developed online store dedicated to rescue animals, My Buddy’s Marketplace. Shoppers can buy name brand, top quality food and products and designate 6% of sales to the animal welfare org of their choice. All remaining proceeds support marketing, development, and support of the rescue platform. “I want to redefine the business of rescue and help save more great animals”.